The all-Ukrainian march in defense of the rights of children and family took place on June 2 this year. 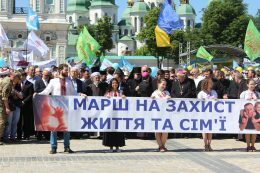 This is the third and the largest march organized by the All-Ukrainian Council of Churches and Religious Organizations. The event started with a concert, games for children, thematic exhibitions and master classes. Ukrainian Muslim Women Association together with Religious Administration of Ukrainian Muslims acted as co-organizers of the event on behalf of the Muslim community of the country. Our activists have been showing the ways of wearing a headscarf – hijab and also they have been told people about Muslim family traditions. Marsh’s goal is to draw the attention of the public and authorities to the moral and spiritual foundations of family and marriage as a union of a man and a woman, which is necessary for harmonious education and healthy development of children. “In order to preserve family values, children must be taught to respect and honor their parents. From an early age, everyone should understand what is his role in a family. After all, God created us as a man and a woman and divided the duties and rights between us in accordance with our possibilities. When everyone feels responsible, this will be an effective method for preserving the family. It is also very important to turn our attention to the example of Muslim countries where different generations live together under the same roof. In a large family, children are never left unattended, they are taught to be generous, sacrificed, kind, willing to help, respectful for their elders, they imitate parents and ancestors, adopt their formula for the relationship of generations. In such families, an egoist with a consumer outlook on life is less likely to grow up. Care and responsibility in such a family is a good example for society. It’s exactly what we need to be equal to! ” – shared Sheikh Rustam Gafuri, Deputy Mufti of Ukraine.